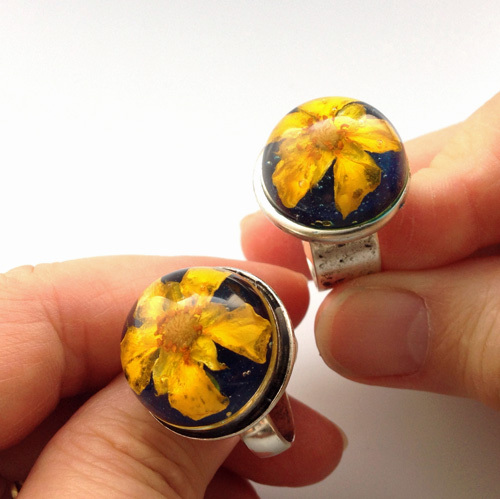 Making real dandelion and flower resin jewelry is not technically difficult. But as they say, one learns by doing. I was inspired to try by Shireen Nadir (The Blue Brick), a Canadian resin jewelry artist I featured before. In the previous tutorial, I experimented with using silica gel - crystal cat litter - to dry dandelion clocks and flowers. 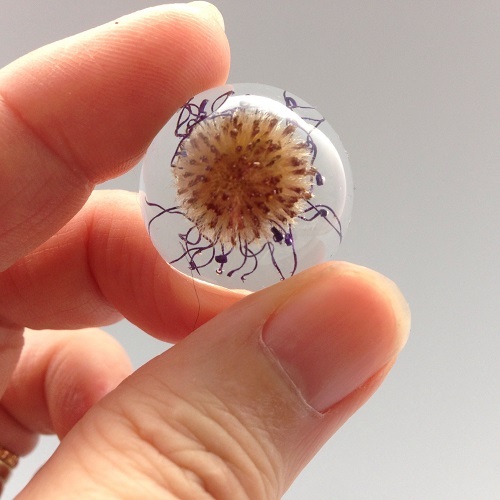 The next stage is embedding the dandelion and flowers in resin and finally turning them into jewelry. As I said before, the process is not technically difficult but it will require care and patience. The resin is best applied in multi-stages. 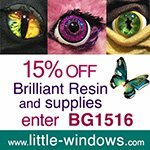 Working in batches also helps as once you have activated the resin, you need to use it all up. So plan your work flow. I used Little Windows' resin mix which I had received for review. It's a great resin but note that the proportion is different from other brands. It is 2 parts of A to 1 part of B. Don't like squinting and trying to see the markings of the plastic cup? 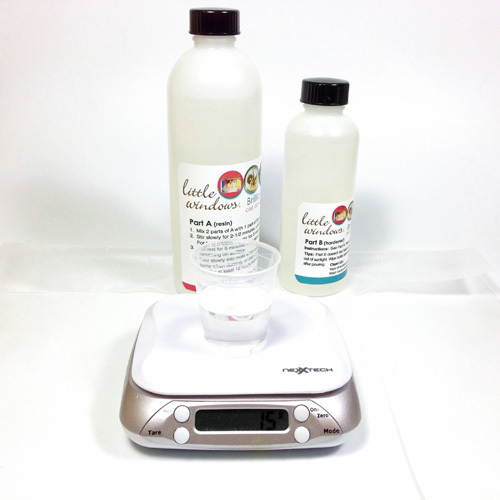 Use small scales and measure out the parts by weight. For example, I used 10 g of A and 5 g of B. I prefer to make up small batches as it is easier to anticipate needs and not waste any resin. I also followed their instructions, stirring carefully for about 2.5 minutes until I don't see any swirls within the mixture. Try not to create bubbles. Leaving the mix under a lamp for 5 minutes afterwards really helps. Any unavoidable bubbles rise to surface and can be moved to the side of the cup be "popped". If you do a lot of resin work, make sure to work in a ventilated environment or at the very least have a fan blowing across the work area. I don't usually do so but you can also wear gloves (use nitrile ones). 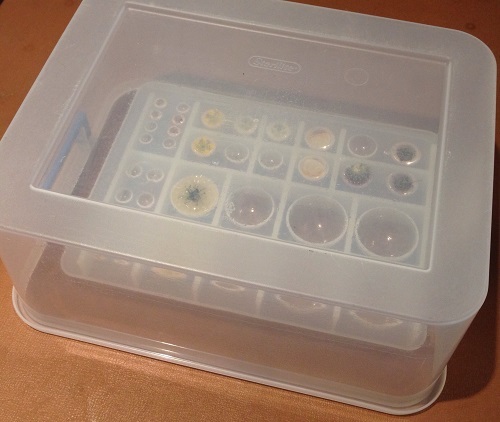 I also used Little Window's round cabochon mold which came with the resin I received. 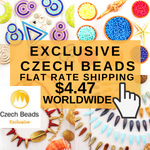 It has multiple sizes and replicates of sizes which are ideal for jewelry making. These yield half spheres. Once the resin has been mixed and is ready for use, fill the mold about 2/3 up. For the dandelion clock, I used the second largest size. 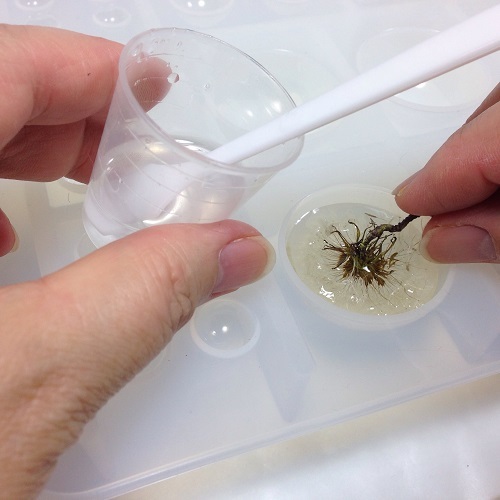 Gently and slowly push the clock into the resin until fully submerged. Smaller flowers can be positioned using the stir stick or even a toothpick. The latter is good for popping bubbles if there are any obvious ones. Always let resin cure under cover. There is nothing more frustrating than dust! You can certainly touch the resin after 12 hours without leaving fingerprints. But I would leave it a full 24 hours. Another tip once you are done. Clean out resin cups and stirrers with dry paper towels and they will be good to go next time. 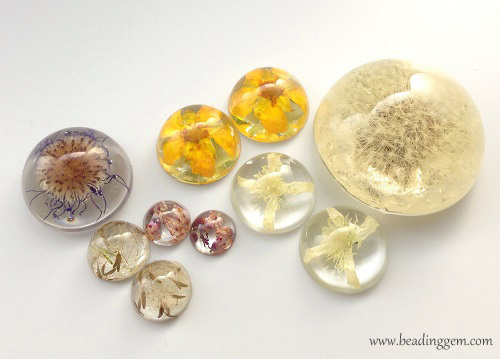 The real flower resin cabochons look like they have been encased in glass. There were tiny bubbles here and there but I thought they added to the pieces! I had left part of the dandelion clock stem as a "handle". Next time I will not so in order to save effort. This time I had to first trim off as much of the organic material as possible. If you look closely, the resin cabochon are concave when set. I think adding just a bit more resin to level out the back is worth the effort because it avoids the huge bubble issue as you will see further down. This means a second round of resin making and pouring. See what I mean about multi-stage and patience? I usually like to add some color to the bottom of the metal bezels I use. When the resin mix is almost gone, I colored it with some Jacquard Pearlex powder (see this post on how to color resin). Before pouring a small amount of colored resin into the bottom of the bezel, make sure it is level. You can always lay completely flat bezels on a sheet of waxed paper to protect the surface. 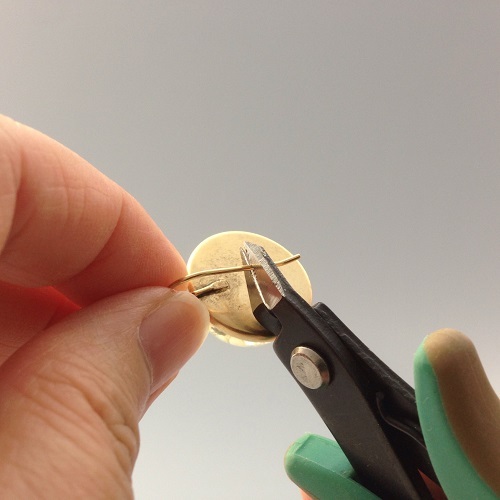 But if the bail of a pendant makes the bezel uneven, put it on a box and let the bail part protrude as shown below. I am using the wonderful silicon doming tray I bought from Little Windows - any accidental spills can be popped out after the resin cures. The lovely earring bezels I bought from Nunn Design were trickier to lay flat. 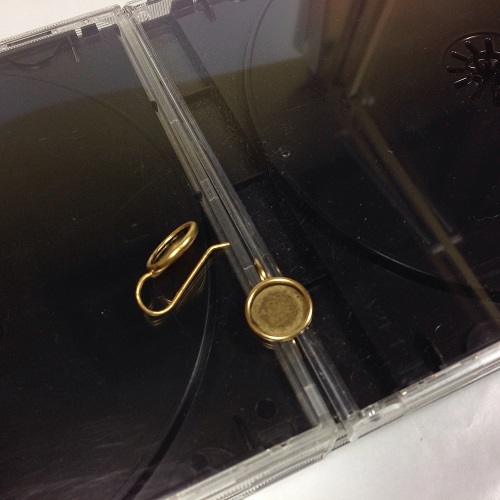 So I got two stacks of empty CD cases and positioned the earring so the bezel is flat. As before cover and cure. Once the colored resin in the bezels are cured, it's time to add the flower resin cabochons. Resin is a wonderful glue in itself. So prepare another batch of plain resin and add some to the bezels which should be flat positioned. I like to use the stirrer to add drops of resin. 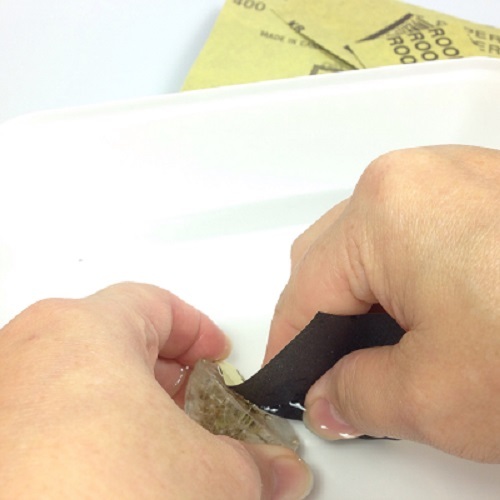 Carefully place the resin cabochons onto the fresh resin. Let it cure. As the resin cabochons were concave at the back, the clear resin "glue" was not sufficient to fill this gap. The lower earring bezel trapped a very large bubble. The other one wasn't too bad. These were tiny white 4 petal clematis flowers. I trimmed the salvageable one by trimming the ear wire and making a bail with the rest! On one hand the glass like cabochons were great. On the other the reflections were hard to avoid in photography! This pair of earring drops were not filled with any resin color. With smaller pieces, the trapped bubbles were more central and adds to the design. 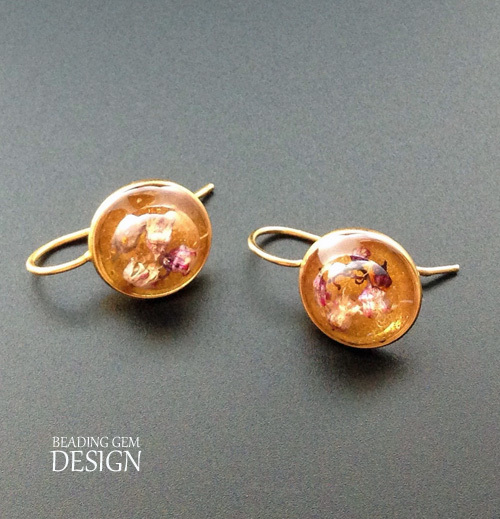 This Nunn design earring pair had a gold colored resin background. Both earrings above were made with the tiny flowers of my favorite perennial, the well behaved coral bells (Heuchera). They dried easily. The New England Aster's petals shriveled up while drying leaving behind a very interesting fuzzy core. The yellow potentilla flowers dried more or less okay. I debated on whether to seal them with a few layers of acrylic spray before embedding in resin but didn't. So you can see darker areas in the petals where they had become translucent. 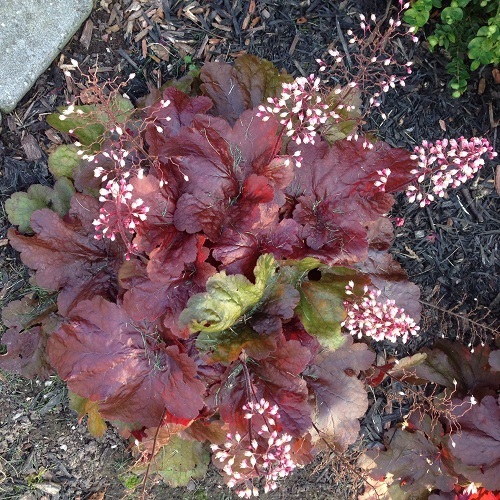 But the white clematis and coral bell flowers were not affected. To seal or not to seal will depend on the flowers. I'd say to seal as a precaution with bigger petaled flowers. I still liked the cool flowers in the cabochons above so went ahead and mounted them on Nunn Design rings. 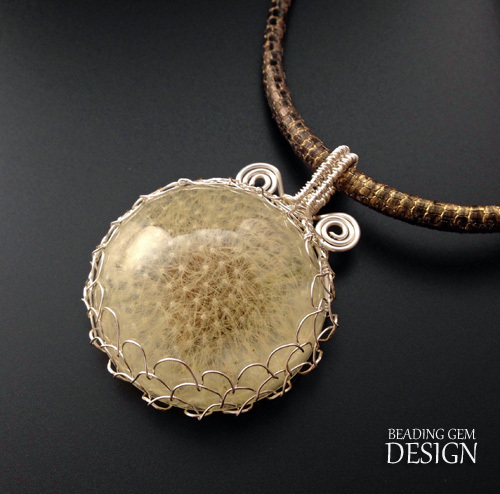 As I did not have large enough bezels for the dandelion clock resin cabochons, I used wire wrapping instead. The wire net bezel tutorial will be out tomorrow. All final photos were taken with my iPhone 5, camera+ app and with the Modahaus TS400 light studio. I used the native camera app for the outdoor shoot. The tutorial pictures were accomplished in my windowless basement studio with the aid of 2 100W daylight CFL lamps. 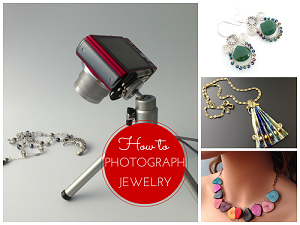 For more information on my how to photograph jewelry webinar, click here. It is time consuming overall and it requires planning in order to be efficient. But as you say, the results are worth it! Incredible tutorial Pearl. And Why? Because you showed us your 'oopsies' as well and told us what to do about them. I appreciate that! I think your results were gorgeous! I particularly liked the coloured resin in the bottom to show off the flowers. AND - something else I noticed! NO BALL CHAIN!! This set of tutorials was probably the most time consuming I have ever done. Still I learned a great deal from the experiment and could share. Everyone should also know why dried flower jewelry artisans charge what they charge for their work. It takes time, planning and allowances for the failures. LOL! I still have ball chain and may yet use them another time! Those are beautiful and unique, Pearl. I'm going to have to try that some day. There are so many different flowers to use. I hope you do! 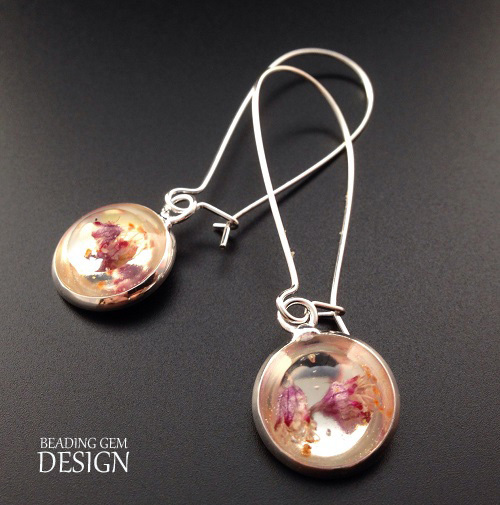 I can see how dried flower resin jewelry focals can look wonderful teamed up with gemstones like yours! Interesting comments, Divya. Note that in most of the bezels, I am not attaching directly to the bezel but onto a layer of colored resin. Either way, if I apply only at the edges of the concave cabs, there is not enough contact surface area to ensure the cab will stay on. But yes, convex objects (at the bottom at least) will be as with any embed resin project. Pearl, to get a shiny surface after sanding, just paint a thin layer of resin where you sanded. 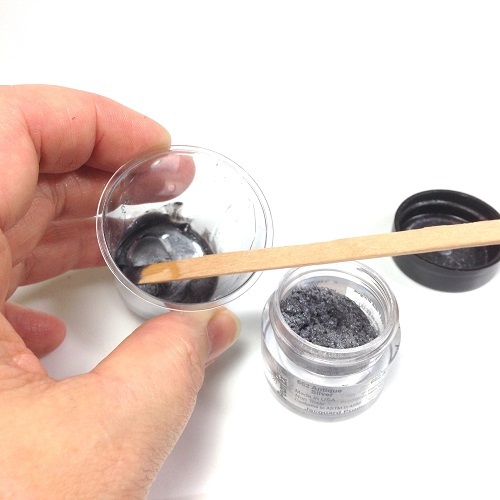 Or, if you aren't going to sell it, and don't feel like mixing up more resin (since there is a minimum amount you must mix for it to set), use clear nail polish. Works like a charm. Excellent tip, Linda. I will update the post with it. I thought that might be the case but I was avoiding having to make up another batch of resin! I picked clocks which were still "fresh" ie not about to easily lose their seeds. I just gently handled them. No problem. Oooh, bachelor buttons is an excellent idea! I will have to try that too next year. 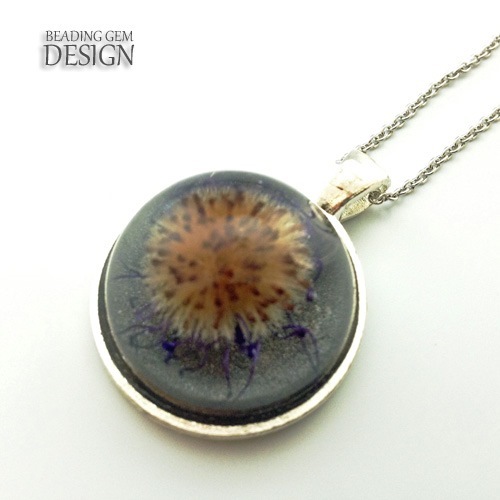 How did you get the dandelion clocks to not have a matted look when you put them in the resin? I'm thinking about doing a few individual seeds for wish pendants, but don't want them to turn out looking like a wet, bedraggled seed. Yours seem to look very nice and fluffy just as they were in the grass. The clocks are dry and the trick is to put it into the resin very,very gently. Try it and you will see. 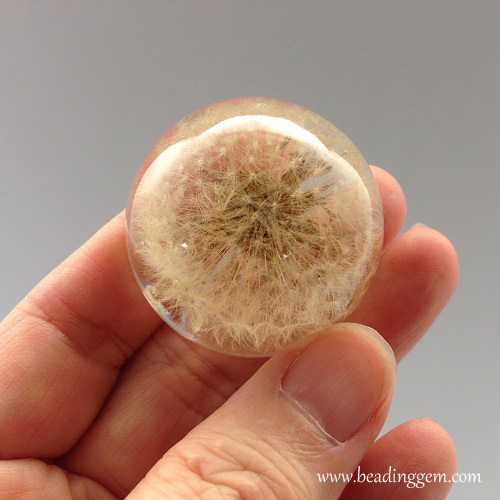 How did you get the dandelion to not stick together when putting it in the resin? Hi Pearl! 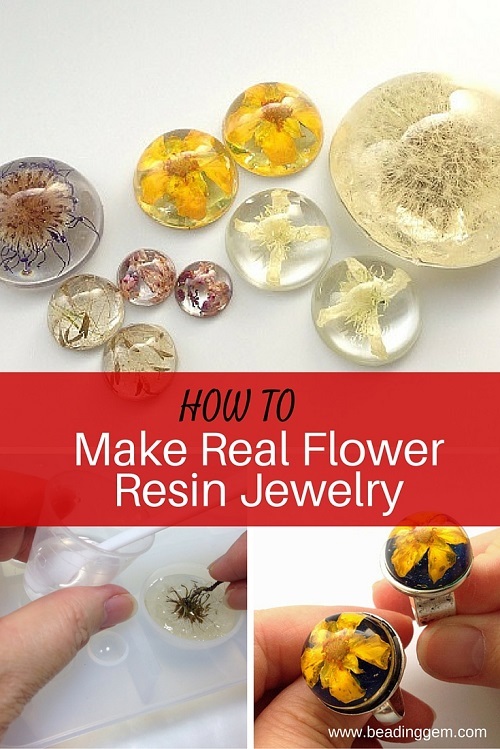 I love your flower resin jewelry and this is a great tutorial too! I just had to share it on Facebook! Do the colors of the flowers fade over time? Beautiful work! Yes they do with time but how fast will depend on how much sun they are exposed to. l have a clover resin piece of over 40 years, and the colour is still the beautiful pink and white that l purchased. Perhaps fading has to do with what is used. Really great tutorial! Thanks so much! Anxious to give it a try. I can't give a cost because it will depend on what you want to buy. 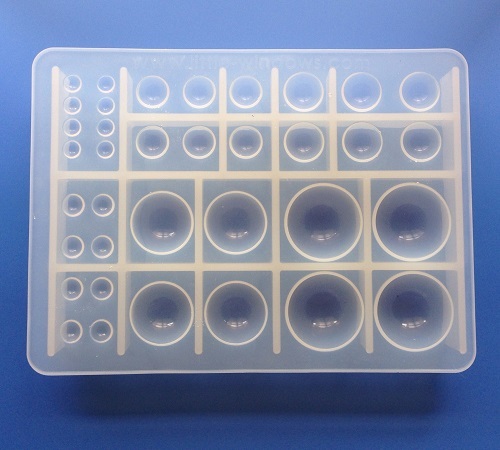 You will certainly need resin, bezels or molds, jewelry findings (costs will be different for rings, earrings, necklaces). Maybe check on Fire Mountain Gems, or on Amazon to see prices. 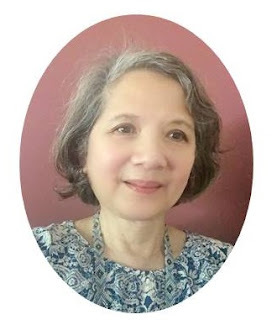 Welcome to my blog and community, Kat! 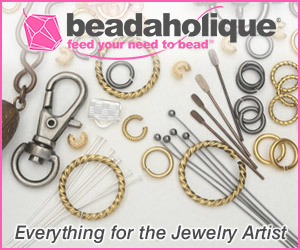 We are all passionate about jewelry making. I love orchids too! Yes, the flowers (and leaves) have to be dried otherwise they will rot inside the resin. I have seen orchids in resin before. You must dry them - the best way is burying them carefully in silica gel. (Check out my post with crystal cat litter which is silica too). Then painting many layers of resin on them. Or encase them in a large mold (won't be jewelry then!). Have a go! Hi Pearl, I have a question for you. 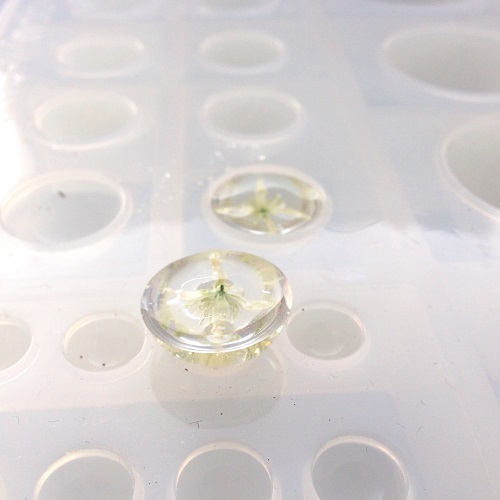 I have tried to make resin jewelry with flowers and found that the flower always floats to the top (which is actually the back) of the mold. How do you avoid this? There are two possible solutions. One is to work in layers. So when you do the flower layer, make it thin. Let this layer cure before adding the next layer. 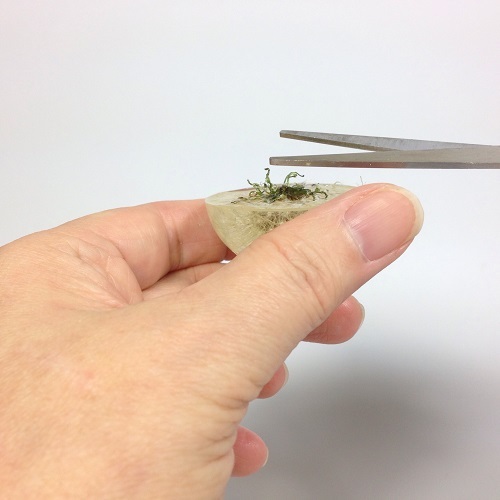 The other solution is to add a transparent glue - I use Mod Podge or a small drop of resin to hold the flower down. Let this set before pouring the next batch of resin. Hope this helps. Can you use fresh flowers as opposed to dry for this? Alas, no. You must dry them otherwise the flowers will rot inside the resin. 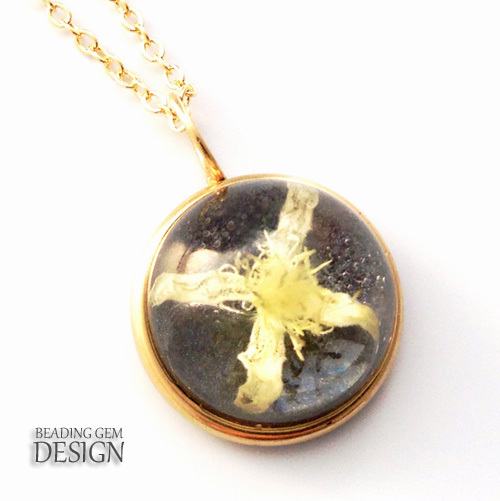 do you know why our flowers changed colour while we had it inside our cabochon? The flowers' color pigments fade with long exposure to sunlight. The problem is probably more acute if you live in sunny climes. Sometimes there is a reaction with the resin itself. ah.. I think we kept it indoor most of the time.. I think the latter is more possible. I will have to try your type of resin. It almost look like you've dyed the flowers. It's so pretty! No, it is not really the resin but the type of flowers. 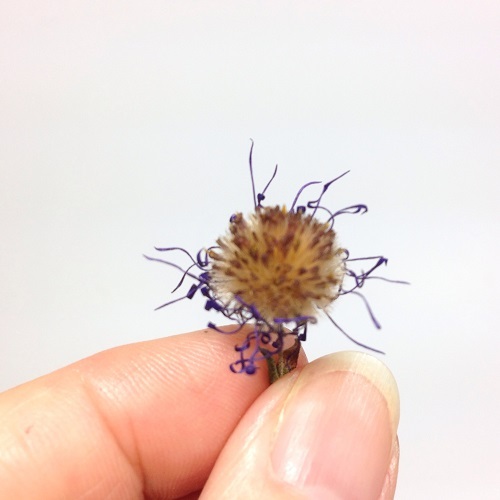 You need to experiment with different kinds of flowers each of which will either react or not react with the resin. Sometimes, it takes some time for the resin effect to kick in. Using dye or paint is an option that some people use. This tutorial is great! I'm just wondering, is it possible to use big flowers for a small piece? Eg. Is it possible to use a rose for earrings, or am I limited to using small flowers? How do I shape them down to size? Sorry if this is a pointless question but I am new to this. Any help is greatly appreciated! No you are not limited to small flowers. But you could try carefully trimming the petals of large ones to fit the molds or bezels. You can also use larger molds like the one I used for the dandelion clock. I am hoping to try a whole small orchid at some point! Hi Pearl, A hundred years ago, long before the Internet, I found myself in possession of some resin. I don't remember much about the process I used, other than it was a huge flop. Can't even remember much about what was wrong lol but one thing I do remember is some of the flowers bled their color into the resin. Have you experienced this? Do you think it was the type of flowers or possibly the type of resin? It's just something that I haven't seen addressed and was curious about. The flowers had been dried in a white crystaly powder substance that my mom had. I assume it was silica something. Lol like I said 100 yrs ago, early 70s. Thanks for your wonderful blog. Love it! Thanks so much for your kind words, Valerie! 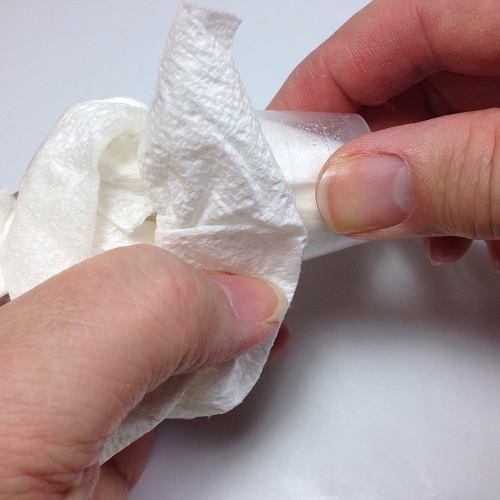 It helps to seal the flowers - use some sort of spray varnish if the flowers you use can bleed. 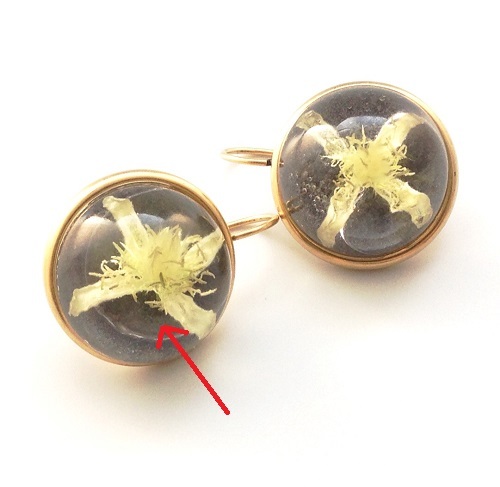 Also note that real flower resin jewelry should be stored out of sunlight as some the natural pigments do fade over time with exposure. 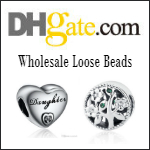 I'm looking for a mini rose petal or mini rose bud beads. Is it possible to be done? I'm hoping to find a rosary that's has real roses pressed into the beads. Can this be done with mini roses or rose petals? I'm looking for a rosary with this style of heading. Yes, it can. Round beads are trickier to do than the kinds I do here. Thanks for this! I was wondering if you could help me as I want to make a different kind of product but using similar materials. 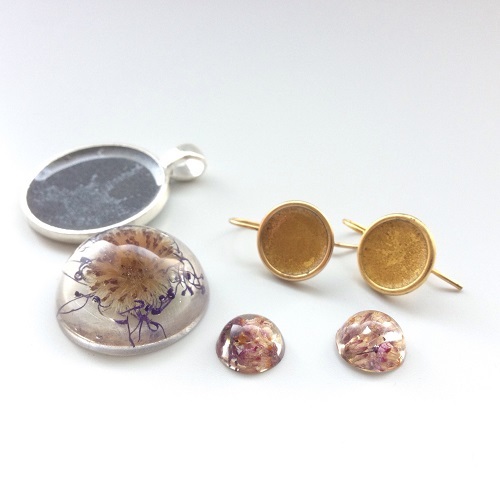 More specifically, dried flowers in resin without a bezel - perhaps drop earrings attached to a flat disc of dried flowers. But, I am new to this and before buying heaps of products would like to problem solve in my mind! Firstly, is it hard for you to get the finished resin out of the molds? And do you know if you could use silicon as a mould? Or even perhaps, if I wanted a more unfinished look, not have a mold at all and be able to shape something free hand on some sort of surface? Secondly, I was thinking it could kind of be interested if I could slightly colour the resin to be still translucent but a colour - if so, any tips on what product I could use? And can one drill in to resin, or should a mold allow for a hole to be made (to attach to an earrings base)? Or better yet, could I just let the resin set around my fixings? Yes, you can color the resin. If you want to stay transparent use either transparent resin dye or perhaps a drop of alcohol ink. You can drill into cured resin - most peopel do this. It is not always possible to put the findings the way they should be placed into resin before it cures. But sometimes it can be done. I think you should just take the plunge and start with a simple mold and some resin. 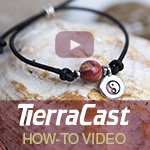 Once you begin, you will find that with experience and experimentation, you will understand how to make resin jewelry!! Do not forget to check my past posts!! These are abslutely stunning. I live in the Florida Keys and we have beautiful flowers that grow year round and I have wanted to do this. My question, what do you use to dry your flower in? Have fun! Please check (use search box) for my other real flower jewelry ideas. One deals with fading colors. Hi Rose( rather app name for some one who makes flower jewelry) thank you it has given me some ideas I will have to try the dandelion clock.You have made some beautiful pieces. I think a lot of people think that it is easy but I have made castings for a while and constantly making improvements and still have a lot to learn. I like the idea of using the resin as a glue so obvious but I didn't think of it.Thank you for sharing. Sorry Pearl I have just realised I called you Rose. No worries! I've been called worse names! But yes, Pearl is an apt name for someone like me. I used to consider it rather old fashioned. But now, it is perfect for what I do. I'm so glad I found your site! 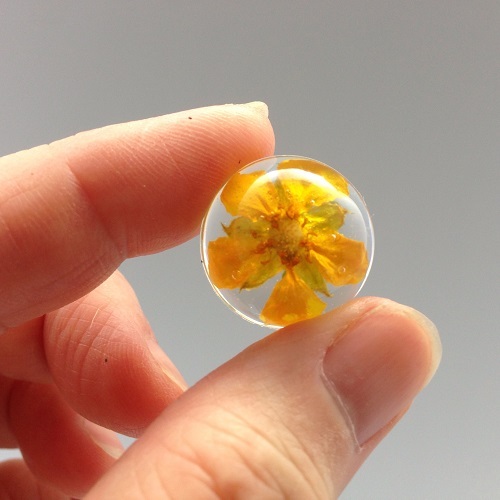 I have been wanting to make clear, resin-encased dried flower pendants for some time now, and this has inspired me to go for it. I never knew it could be so easy (albeit somewhat time consuming). I love all the super helpful tips you give throughout the tutorial and the honest/candid way in which you provide them. As a newbie myself, it makes your tutorials much more attractive than some of the expert/professional produced ones. Thank you so much for providing so much great, free content! You rock! Welcome to my blog, Bailey, and this enthusiastic community! I do try out many things to show readers. It helps cut the steep learning curve and also helps people avoid some of the common mistakes....especially when I show how I made them! !